As the people of the United States watched World War I ignite across Europe, African American citizens saw an opportunity to win the respect of their white neighbors. America was a segregated society and African Americans were considered, at best, second class citizens. Yet despite that, there were many African American men willing to serve in the nation's military, but even as it became apparent that the United States would enter the war in Europe, blacks were still being turned away from military service. Following the Civil War, the Army disbanded volunteer "colored" regiments, and established six Regular Army regiments of black troops with white officers. In 1869, the infantry regiments were reorganized into the 24th and 25th Infantry. The two cavalry regiments, the 9th and 10th, were retained. These regiments were posted in the West and Southwest where they were heavily engaged in the Indian War. During the Spanish-American War, all four regiments saw service. When World War I broke out, there were four all-black regiments: the 9th and 10th Cavalry and the 24th and 25th Infantry. The men in these units were considered heroes in their communities. Within one week of Wilson's declaration of war, the War Department had to stop accepting black volunteers because the quotas for African Americans were filled. Run by then LTC Charles C. Ballou, the fort's staff of twelve West Point graduates, and a few noncommissioned officers from the four original all-black regiments put the candidates through a rigorous training routine. They practiced drilling with and without arms, signaling, physical training, memorizing the organization of the regiment, reading maps, and training on the rifle and bayonet. However, as Ballou noted after the war, the men doing the training did not take the job very seriously, and seemed to consider the school, and the candidates, a waste of time. Consequently, the War Department determined that the instruction at Fort Des Moines was poor and inadequate. Also adding to the poor training was the fact that no one knew exactly what to expect in France, so it was difficult to train as precisely as was needed. 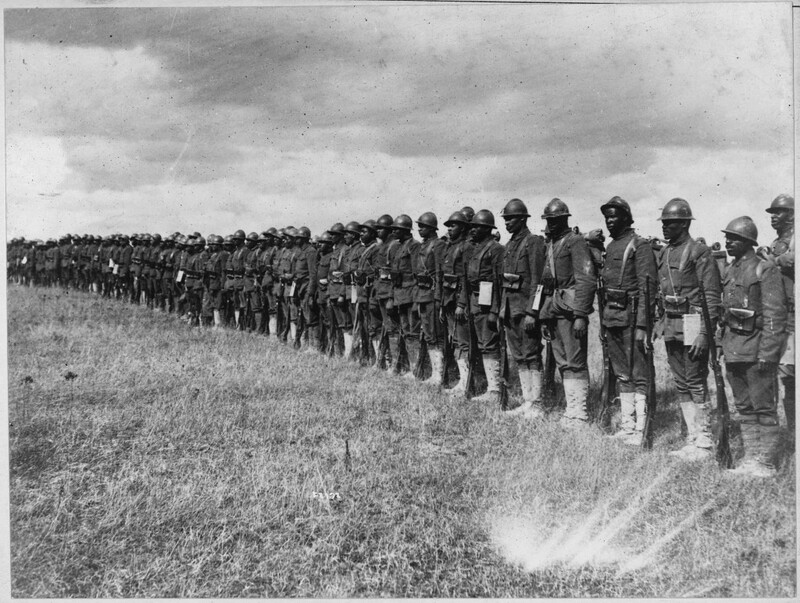 On 15 October 1917, 639 African-American men received their commissions as either captain or first or second lieutenant, and were assigned to infantry, artillery, and engineer units with the 92d Division. This was to be the first and only class to graduate from Fort Des Moines; the War Department shut it down soon after their departure. Future black candidates attended either special training camps in Puerto Rico (from which 433 officers graduated), the Philippines, Hawaii, and Panama, or regular officer training facilities in the United States . Although African Americans were earning higher positions in the Army, that did not necessarily mean they were getting equal treatment. Black draftees were treated with extreme hostility when they arrived for training. White men refused to salute black officers and black officers were often barred from the officer's clubs and quarters. The War Department rarely interceded, and discrimination was usually overlooked or sometimes condoned. Because many Southern civilians protested having blacks from other states inhabit nearby training camps, the War Department stipulated that no more than one-fourth of the trainees in any Army camp in the U.S. could be African American. Although not nearly as respected as any of the white soldiers involved in the war effort, African American combat troops, in many respects, were much better off than the laborers. The two combat divisions–the 92d and 93d Divisions–had two completely different experiences while fighting the Great War. Although in no case did a black officer command a white officer, most of the officers (up to the rank of first lieutenant) in the unit were African American. Unlike just about every other American unit training to go into battle, soldiers from the 92d were forced to train separately while in the United States. The War Department, fearing racial uprisings, was willing to sacrifice the unit's ability to develop cohesion and pride. The lack of a strong bond between the men was one of the factors that led to the unit's poor performance in the Meuse-Argonne campaign. Even COL Allen J. Greer, Ballou's chief of staff, was in on the plan to sabotage the reputation of his African American unit, and helped put a negative twist on stories from the front lines. Regardless of how well the 92d Division actually did on the battlefield, it was virtually impossible to overcome the slander from prejudiced officers. Following some initial successes in Lorraine in mid-August, on 20 September 1918, the 92d was ordered to proceed to the Argonne Forest in preparation for the Meuse-Argonne offensive. The division reached the front lines just before the first assault. The 368th Infantry Regiment immediately received orders to fill a gap between the American 77th Division and the French 37th Division. However, due to their lack of training with the French, shortages of equipment, and unfamiliarity with the terrain, the regiment did not successfully complete this important assignment. The failure to accomplish this crucial mission blemished the 92d's combat record, and it was often used by military authorities for more than thirty years to prove the inadequacy of African American soldiers in combat. After the disaster in the Argonne, the entire division was sent to a relatively quiet area of the front in the Marbache sector. Their primary mission was nevertheless a dangerous one: harass the enemy with frequent patrols. The danger of the assignment was reflected in the 462 casualties sustained in just the first month of patrolling. Although American commanders were dissatisfied with the unit's performance, the French obviously had a different opinion–they decorated members of the 365th Infantry and 350th Machine Gun Battalion for their aggressiveness and bravery. The 369th Infantry was the first regiment of the 93d Division to reach France. They arrived in the port city of Brest in December 1917. On 10 March, after three months of duty with the Services of Supply, the 369th received orders to join the French 16th Division in Givry en Argonne for additional training. After three weeks the regiment was sent to the front lines in a region just west of the Argonne Forest. For nearly a month they held their position against German assaults, and after only a brief break from the front, the 369th was placed once again in the middle of the German offensive, this time at Minacourt, France. From 18 July to 6 August 1918, the 369th Infantry, now proudly nicknamed the "Harlem Hellfighters," proved their tenacity once again by helping the French 161st Division drive the Germans from their trenches during the Aisne-Marne counter-offensive. In this three-week period, the Germans were making many small night raids into Allied territory. During one of these raids, a member of the 369th Infantry, CPL Henry Johnson, fought off an entire German raiding party using only a pistol and a knife. Killing four of the Germans and wounding many more, his actions allowed a wounded comrade to escape capture and led to the seizure of a stockpile of German arms. Johnson and his comrade were wounded and both received the French Croix de Guerre for their gallantry. Johnson was also promoted to sergeant. Although the 369th won much of the glory for the 93d Division, the 370th, 371st, and 372d Regiments, each assigned to different French divisions, also proved themselves worthy of acclaim at the front. The 370th fought hard in both the Meuse-Argonne and Oise-Aisne campaigns. Seventy-one members of the regiment received the French Croix de Guerre, and another twenty-one soldiers received the Distinguished Service Cross (DSC). Company C, 371st Infantry, earned the Croix de Guerre with Palm. The 371st Regiment spent more than three months on the front lines in the Verdun area, and for its extraordinary service in the Champagne offensive, the entire regiment was awarded the Croix de Guerre with Palm. In addition, three of the 371st's officers were awarded the French Legion of Honor, 123 men won the Croix de Guerre, and twenty-six earned the DSC. On 11 November 1918 at 1100, the armistice between the Allies and Central Powers went into effect. Like all other American soldiers, the African American troops reveled in celebration and took justifiable pride in the great victory they helped achieve. It was not without great cost: the 92d Division suffered 1,647 battle casualties and the 93d Division suffered 3,534. Expecting to come home heroes, black soldiers received a rude awakening upon their return. Back home, many whites feared that African Americans would return demanding equality and would try to attain it by employing their military training. As the troops returned, there was an increase of racial tension. During the summer and fall of 1919, anti-black race riots erupted in twenty-six cities across America. The lynching of blacks also increased from fifty-eight in 1918 to seventy-seven in 1919. At least ten of those victims were war veterans, and some were lynched while in uniform. Despite this treatment, African American men continued to enlist in the military, including veterans of World War I that came home to such violence and ingratitude. They served their county in the brief period of peace after the World War I, and many went on to fight in World War II. It was not until the 1948 that President Harry S Truman issued an executive order to desegregate the military, although it took the Korean War to fully integrate the Army. African Americans finally began to receive the equal treatment their predecessors had earned in combat in France during World War I, and as far back as the American Revolution. For more reading on African American soldiers in WWI, please see: The Unknown Soldiers: African-American Troops in WWI; by Arthur E. Barbeau & Florette Henri, The Right to Fight: A History of African-Americans in the Military, by Gerald Astor; and Soldiers of Freedom, by Kai Wright. About The Army Historical Foundation The Army Historical Foundation establishes, assists, and promotes programs and projects which preserve the history of the American Soldier and promote public understanding of and appreciation for the contributions by all components of the U.S. Army and its members. The Foundation serves as the Army's official fundraising entity for the Capital Campaign for the National Museum of the United States Army. The Museum will be constructed at Fort Belvoir, Va., to honor the service and sacrifice of all American Soldiers who have served since the Army's inception in 1775. For more information about the Foundation, the National Museum of the United States Army, and the Registry of the American Soldier, visit www.armyhistory.org.